In our Dylanesque neverending tour, we've supped at a wide range of eating establishments: the traditional tearoom, such as No 10; the modern coffee shop, such as Sangha; the upmarket deli, such as the Fine Food Company; the downmarket caff, such as the Family Cafe; plus the odd chippy, pub, golf club and, er, antique shop. Maybe the closest we've come to a proper transport cafe before has been the Kesgrave Kitchen, but they didn't have to pick a fight with the Highways Agency to serve not just truckers but the general public too. 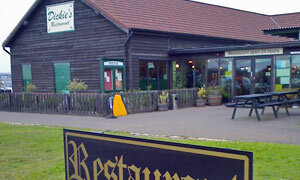 Sitting defiantly on the A14 is the Orwell Crossing, aka Truckstop, or Lorry Park, though the restaurant is called Dickie's and the bar is called Olive's. Its names are manifold. Oddly, it occupies the same stretch of land as a now defunct McDonald's and petrol station. We came in the secret way -- nuff said, wink wink -- and were a tad alarmed to find ourselves going in behind a coach party. Once in, I found it tough to take in the surroundings. For instance, there's often live music of an evening (this is home to the Suffolk Bluegrass jam sessions), and there are showers, and there's a coin-operated PC for email & web, and there's a large telly on the wall showing Christmas pop videos. Is that really Mel Smith? Hard to categorise, esp when you learn that they grown their own veg round the back. Lots of food options on large chalk boards, and by no means chips with everything. Service is terrific, and my sausage and mash and onion rings and peas and gravy was mighty fine: bangers from posh Proctor's in town, natch. Not that I remotely needed any more food, but I couldn't resist a chocolate brownie and ice cream. Also good, as was the mug of coffee. This place pickpockets your expectations, gives them a blinding Brasso shine then puts them back wrapped in a winning scratchcard. Leave your Peterbilt 379 in the driveway and steer your Smart car to the Orwell Crossing soon. If it was a car -- El Camino. If they were passing by -- Mark Benton.